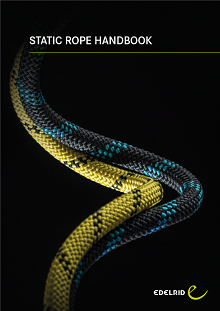 Edelrid’s Static Rope Handbook is an excellent resource for any rope user. It includes lots of information including fibre to rope manufacturing, testing & labeling, norms & standards, care & maintenance and PPE inspection. Click on the image to download from dropbox. This entry was posted in Edelrid, LATEST NEWS, Workbooks and tagged arbor, climbing gear, edelrid, height safety, resources, tech talk, workbooks. Bookmark the permalink.